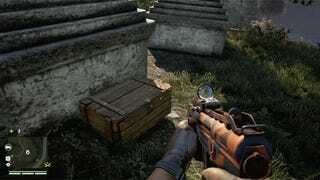 Far Cry 4 is the kind of game that's deeply in love with its loot. It wants you, the player, to love its loot too. So it packs the stuff full of silly jokes and insular references. Here are some of the silliest I've seen so far. Is this a Grand Theft Auto V reference? I'm gonna choose to read it that way. Hey, maybe the gloves went with the pliers? Well, at least they're consistent! Rook Island was the tropical dream-land setting of Far Cry 3. Hey, that's almost the same name as Far Cry 4! At first I thought this was throwing shade at Justin Bieber, Carly Rae Jepsen, or both. But then a co-worker reminded me that the best match for "French-Canadian pop diva" is clearly Celine Dion. Way to date yourself, Far Cry 4! Would you kindly appreciate this reference? I don't know what to make of this one, but it sure made me chuckle. Jokes like the ones Far Cry 4 makes can be good or bad thing, depending on how you feel about video game loot in general. But at the very least, it's nice to see that the new Far Cry can have a little fun with itself. Plus, reading the cheeky descriptions of items really helps break up the monotony of opening flashing chests in the game until your loot bag is full and then selling everything inside. Unless your wallet is full too, in which case you need to go kill and skin more animals to take care of that situation. I'll have a full review of Far Cry 4 later this week. In the meantime, check out my impressions based on my first 20 hours with the game.